All sorts of tug boats from around the world. Investigate this long list of 31 different tugs. All can be made to R/C. Invader was the first in a series of 25 high-horsepower tugs built for Crowley Maritime during the 1970s, and these boats are still the mainstay of the Crowley sea-going fleet today. Powered by the largest GM diesels ever built for ocean service, these 9,000 horsepower brutes are famous for their high towing speeds and bollard pull. The 136-foot Invader class boats are, pound for pound, some of the most awesome boats working and are used for everything from ultra-large ocean tows, to tanker escorts, to harbor ship assists. 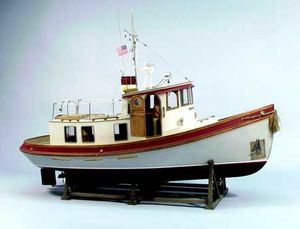 The Harbor Models semi-kit includes a 1-piece fiberglass hull with bulwarks and caprail molded on, fiberglass superstructure, smokestack with plenum and pilothouse, plywood deck, as well as a cast polymer fitting set which includes doors, life rings, portholes, hatches and more. Also comes with a top and side view of full-size plans. High strength fiberglass hull. This hull has the same dimensions as the original Dumas version, but the similarities end there. This magnificent hull is made with two layers of hand-laid-up (not choper gun applied) fiberglass. This construction method creates an extremely heavy duty hull that can easily support the 65lb ballasted weight of the model. Kort nozzles can be easily and securely screwed to the hull because of the seriously thick fiberglass. The hull also features built-in anchor wells, orientation lines for bow thruster installation, and dimples indicating drilling points for prop shafts, kort nozzles, rudders and support beams for ease of build. The complete superstructure is also included in the kit. 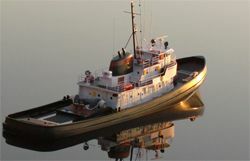 The Pono is a modern 80' harbor tug operated by Sause Bros. Towing of Coos Bay, Oregon. Pono is powerful, highly maneuverable and suited for a variety of ship assist, barge and ocean work. She is powered by 2 Caterpillar 3512 Diesels generating a total of 2,400 horsepower and is equipped with twin 6.7' dia. props inside kort nozzles. A special feature is the installation of 4 rudders behind the nozzles. -Cast Polymer fittings set that includes doors, life rings with brackets, fire hose rack, hatches and more. Built in 1967, at which time she was the most powerful tug in the port of Los Angeles, by Martinolich Shipbuilding of Tacoma, Washington (hull #378) as the San Pedro for the Wilmington Transportation Company of Los Angeles, California. 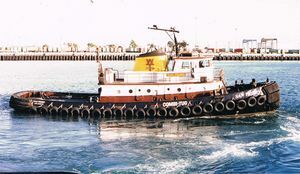 In 1994, the tug was reconfigured. Originally constructed as a single screw tug. She was outfitted with a forward mounted "z drive" unit to augment her existing single screw configuration as well as a kort nozzle, and three rudders. 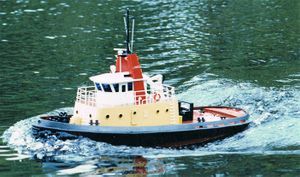 The retrofitted tug was dubbed a CombiTug. And, she was renamed as the Pacific Combi. Powered by a single EMD 12-645 diesel engine. With a forward mounted "z drive" unit. She is rated 3,600 horsepower. The hull and superstructure are fiberglass. The deckhouse is scribed with all door, porthole and other openings. The pilot house has the window frames molded in. 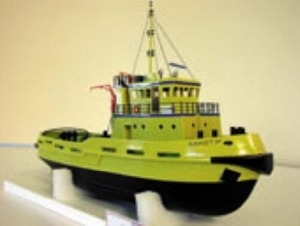 The Happy Hunter is a scale reproduction of a Dutch ocean-going salvage tug to a scale of 1:50. The boat is powered by a direct-drive, i.e. non-geared system, in the form of two high-torque MAX Power 700 electric motors. These are low-revving power plants driving a pair of high-performance marine propellers. Fixed Kort nozzles increase thrust, and the boat is capable of carrying out extremely arduous towing tasks and complex maneuvers in conjunction with the bow thruster, which is an optional accessory. The capacious plastic hull allows the modeler to install numerous auxiliary working systems, and experienced builders will enjoy fitting out the Happy Hunter with a working lighting system, radar, anchor winch, sound system and towing mechanism. It is even possible to install a fully working crane; the crane itself is included in the kit. -Components for foremast, mainmast, crane etc. 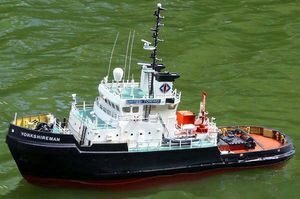 Built in 1978 by Cochrane of Selby, Yorkshireman and Irishman were the most powerful pair of purpose-built tugs to enter service in the UK when they joined the fleet of United Towing. The tugs were been involved in all types of towing work in the North Sea oil fields and around the world. However, their finest and most famous days were without a doubt during the Falklands War when they were taken into service with the Salvageman by the Royal Navy. Their best-known exploit was in the attempt to save the container ship Atlantic Conveyor after she had been hit by missiles from the Argentinean Air Force; unfortunately this rescue attempt was not successful. A set of self-adhesive vinyl decals for Yorkshireman and Irishman. All the necessary wooden dowel for mast, wire, chain etc. Step-by-step isometric drawings and scale plans. Built in 1976 these colorful tugs were in service in the Middle East and the United Kingdom. Al Khubar 1 was black, Al Khubar 2 red and Al Khubar 3 blue. The large number of perspective assembly drawings and full-size plan make Al Khubar a fairly simple project for average modelling skills. With twin propellers and Kort nozzles the model is highly maneuverable and ideal for RC steering and tug towing competitions. Kit recommended for model makers with a little experience. Built for worldwide operations to service and tow drilling units, and support production platforms Aziz and her sister ship Arif were commissioned in 1983 for Prince Offshore of Sharjah, United Arab Emirates. The main feature of their deck machinery is a double-drum waterfall type anchor handling/towing winch, 120 t. pull, diesel driven. Two 3.1 ton capacity tugger winches are fitted behind the superstructure one on each side of the cargo deck and a 6 t. electro-hydraulic deck crane is located on the boat deck for cargo handling. waterslide transfers for the vessel names Aziz and Arif, depth markings, liferaft canisters etc. Kit recommended for model makers with a little experience. The flag, paints and adhesives are not provided. Tools will be required to complete. The Dutch Courage is a representation of Dutch Pride and Dutch Power, two of a series of tugs built in the Netherlands in 2003/04. 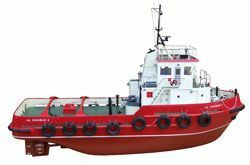 Designed to operate in water depths not readily accessible by conventional tugs of deeper draft these vessels are suitable for a variety of applications including towing, pushing, supply and survey work. These tugs are fitted with a hydraulic telescoping deck crane and the rear deck space allows for the transportation of cargo, including containers. A feature of the vessels is the push-bow with heavy duty rubber fender. Crew complement: 6. 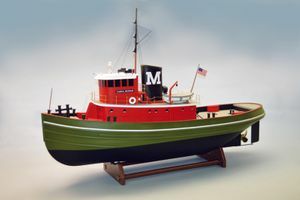 With many step-by-step assembly drawings, instructions and main plans the model is recommended for the experienced modeler and tug enthusiast. It is not suitable for the beginner to modeling. Two frets of etched brass components including window frames, wheelhouse interior details, stanchions, funnel logos, mast ladder/cage etc. Instructions, isometric drawings and plans. ***Note: This kit does not come with a propeller or propeller shaft. All R/C equipment is sold separately. Everybody has an opinion as to which boat they like the best. 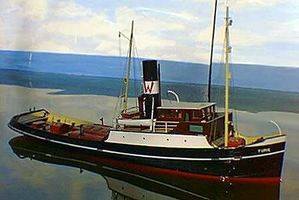 The opinion poll winner is the Victory Tug. 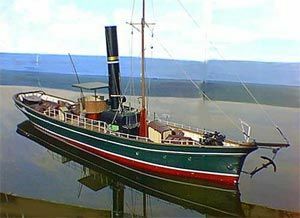 There are a number of reasons why this charming little ship has captured the hearts of so many modelers. At 28 inches long, it is perfect for those of us with smaller working areas. The quality materials, such as the bass wood planking, and stainless steel rails lead to an excellent building result. Basically, everybody loves tug boats, and the Victory Tug with all of her natural wood and scruffy good looks is an exceptional find. 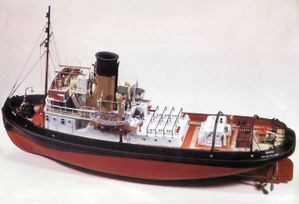 The Dumas model of the Victory Tug provides all the high quality materials necessary to complete the kit for a static model, but does include the running hardware, ie. shaft, prop, rudder etc. If you do decide to radio control the Victory Tug, all you need are one each of the items found below to get her on the water. The Brooklyn was built in 1910 and owned by the New York Dock Co. Steam powered all her career she was inauspiciously sold for scrap in 1960. She was one of many railroad tugs, designed to transfer railroad cars from one side of New York to the other on barges known as car floats. Railroad tugs almost always towed barges alongside, with one car floating on each side, hence the heavy guards and the use of single posts instead of H-bitts. Railroad tugs were characterized by long houses because there was no need of towing space aft. The Dumas kit of the Brooklyn is designed to give you the salty appearance of the original boat. Not just your average tug, the Brooklyn has the characteristics that set the early tugs apart. You get a vacuum formed hull, all the parts to build the conventional die cut superstructure, and enough detail (laser cut parts, lots of castings, brass railings, etc.) to keep you busy through many a long winter night. If you are one of many who admire the pugnacious spirit of tug boats then this one is for you. 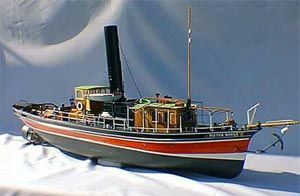 Another classic model from The Model Boat People. 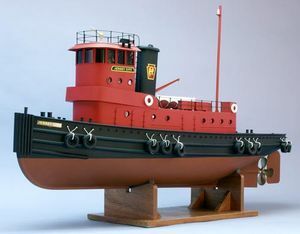 The Jersey City is the lasest addition to the Dumas tugboat collection. A railroad tug from the 1960s, the Jersey City can still be seen working on the eastern seaboard. She is designed for radio control using a two channel radio, or this detailed workhorse makes a great static model for your den or office. Dumas running hardware 2367 is the single screw driveline required to run the Jersey City. Use Dumas motor 2004 for 6v or 2005 for 12v electric power. There is something about a relatively small boat pushing or a towing a comparative behemoth. And at Dumas we are known for our tugs. Whether it be the Shelley Foss, Mister Darby, Brooklyn, or Jersey City, we cover over a century of tugs. 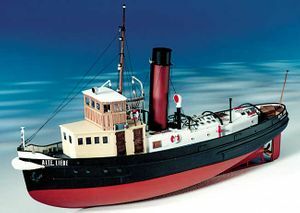 With the introduction of the Carol Moran, we have broken into the area of small highly detailed scale rc tugs. 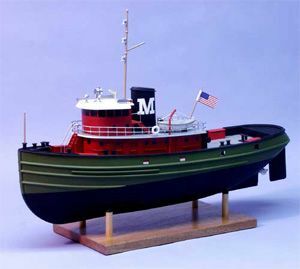 Our model of the Carol Moran features a two piece vacuum formed hull. The superstructure is constructed of highly conformable diecut expanded PVC. There are detail parts galore including everything laser cut and cast parts to decals and flag. Just because she is small does not mean you have to give up realism. Best of all, the Carol Moran is a full functioning rc model. All the running hardware is included, and we show you how to power her using a servo from your two channel radio. So try your hand at the Carol Moran. An exceptional tug at an exceptional value. The George W. Washburn was launched by the Cornell Steamboat Company to move barges and cargo like stones, sand, and bricks up and down the Hudson River between Albany and New York City. She was, during her early years, considered the fastest tug on the Hudson. Since she took on paying passengers, her appearance was kept up. It was said that a Cornell Steamboat could be notices from great distances by the yellow and black color of the smoke stacks. Sad to say, however, that the George W Washburn and Cornell Steamboat Company are no longer around today. This kit features laser-cut plank-on-frame construction. Smit Rotterdam was built in 1975 for Smit International BV in Holland, and was at the time of its completion the largest and most powerful tugboat in the world- with a tonnage of 2273 tons, a 22,000HP engine, and a top speed of 16.5 knots. The ship is built with bulb stern and stern nozzle, inboard equipment includes the most modern gear for navigation, steering and radio communication. Kit includes laser cut wooden hull and wooden strips, stern tube with shaft, rudder, kort nozzle, fittings set, plan and manual. 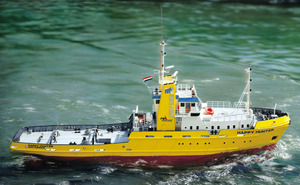 Scale model of a Dutch ocean-going tug. In order to meet the highest quality standards imposed by its world-wide clientele Fairmount Marine ordered no less than five new 205 tons bollard pull long distance towing vessels with anchor handling capacities from the Niigata Shipyard in Japan. Of this series, in May 2005 the 205 tons bollard pull FAIRMOUNT SHERPA was delivered and added to the fleet, in October 2005 sister vessel FAIRMOUNT SUMMIT and in May 2006 sister vessel FAIRMOUNT ALPINE, the largest and most powerful tugs ever built for Dutch interests, followed. In July 2006 FAIRMOUNT GLACIER was delivered to Fairmount Marine. The fifth super tug in the series, FAIRMOUNT EXPEDITION, has been delivered in May 2007. 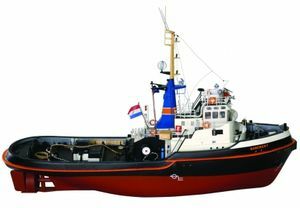 The Dutch "SuperTug", #506 Fairmount Alpine kit can be static or converted to R/C use. It has a wooden hull that is made using wooden planks on laser-cut plywood bulkheads. Designed using the most advanced methods, all laser cut wood, and complete with all fittings. 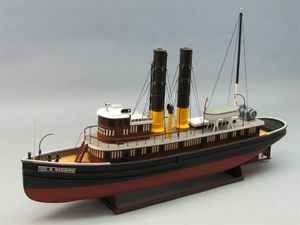 This model boat kit is visually stunning when completed with vibrant colours and exquisite detail. The kit comes supplied with the following fittings: Lifeboats, stanchions, life rings, pulleys, lifeboat canisters, lights, ladders, vents, brass railing, prop shafts, stuffing boxes, props, kort nozzles, decals and instructions and more! Please note that although the laser wood cutting is incredibly accurate and close, there are LOTS of laser-cut wooded parts, including some quite small. The average build time we have with this model is in excess of 400 hours. The kit includes all laser cut superstructure and cabin parts along with an ABS Plastic Hull. The kit also includes all parts and accessories found in the image. This kit brings marine model kits into the 21st century. With seven sheets of CNC cut ply including paneling for the various cabins and screen printed overlays where necessary. Over 300 brass etched fittings and over 750 white metal fittings (forward anchor windlass has over 40 parts alone) make this the most detailed Caldercraft kit to-date. Funnels and hull are molded in GRP with plating detail. All wood, dowel, rod, rigging cord and ships boats to complete the kit are provided. Due to the depletion of the naval tug fleet during the 1914 - 1918 war, the Royal Navy decided to replace the older tugs with several classes of purpose built naval tugs. Largest and most powerful of these were the 'Resolve' class. Six were built in this class between 1917 and 1919. Resolve was fitted with a quick firing 12pdr. gun for defense when on convoy duty or coastal tows during war time (the Resolve can also be painted with a war time color scheme). Resolve remained in the Royal Navy until 1950 when she was sold to messers James Scott and Co. Ltd. for breaking up. Although impossible to describe in detail the features of a model with over 1,400 parts the the following are the most outstanding. Hull, main and rear deck house and funnel are molded in GRP with all rivet and plating detail faithfully reproduced. All decks, wheelhouse etc. are CNC cut from high quality Birch ply. Deck overlays are pre-printed with planking detail. Almost 800 fittings manufactured in high grade alloy of superb quality, with many unique features too numerous to list. It even includes the pantry, sink, jugs, cups, saucers, plates, tables and chairs for the saloon. Lifeboats are molded in styrene with separate interior moldings and all furniture included. Typical of many of the period 'Imara' was a twin screw harbor tug, built to a Crown Colonies contract for delivery to Dares-Salaam. Thereafter she had a colorful history, ultimately entering Royal Naval service where she was renamed 'Perseverance'. A comprehensive instruction book including a detailed history of the full sized vessel and two highly detailed construction drawings. Single and twin screw versions of the hull are available. The twin twin screw version is true to scale, and the single screw version allows for easy installation of a steam plant, both versions look superb on the water. Although impossible to describe in detail the features of a model with over 1,400 parts the the following are the most outstanding. Hull, main and rear deck-house and funnel are molded in GRP with all rivet and plating detail faithfully reproduced. All decks, wheelhouse etc. are CNC cut from high quality Birch ply. Deck overlays are pre-printed with planking detail. Almost 800 fittings manufactured in high grade alloy of superb quality, with many unique features too numerous to list. It even includes the pantry, sink, jugs, cups, saucers, plates, tables and chairs for the saloon. Lifeboats are moulded in styrene with separate interior moldings and all furniture included. Typical of many of the period 'Imara' was a twin screw harbour tug, built to a Crown Colonies contract for delivery to Dares-Salaam. Thereafter she had a colorful history, ultimately entering Royal Naval service where she was renamed 'Perseverance'. The Marie Felling was built by Earls of Hall and launched in 1928. Designed by the same team as the Imara, she was a Crown Colony Contracts vessel and judging by the margin notes of the contract, gave rise to the many improvements incorporated in the later Imara, especially with regard to accommodation. Both were designed for the same type of harbor work. 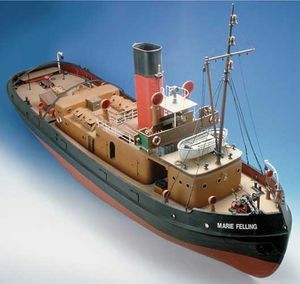 From the deck layout up, the Marie Felling is an unusual and appealing vessel. From the single lifeboat carried cross ship on the sub deck atop the forward saloon and the raised bridge on stilts, not to mention the cross passage through the single superstructure, the massive plain funnel and open funnel deck all combine to give this vessel a unique charm. Model hull is fully detailed, as is the two part superstructure and funnel. All these parts are molded in GRP. Deck and bridge are ply, with a printed ply overlay. Fittings are cast white metal. The superstructure is easily removable to allow easy access to the hull making this model ideal for steam propulsion. The kit is available in either single or twin screw versions. A fully molded GRP hull with plating and rubbing strake detail is complemented with CNC cut ply deck and superstructure. Printed ply overlays are provided along with a comprehensive fittings kit to complete the model. The fully removable superstructure makes this model ideal for steam plant installation. Almost every day for nearly thirty years the tug boat 'Alte Liebe' could be seen in Cuxhaven Harbour under full steam. She was used as a Pilot, Fireboat and Salvage tug. Built in 1931 by the Nobiskrug Gmbh shipyard at Rendsburg on an order from Wasserstrabbendirektion Hamburg, she was launched on 2nd September 1931 and after further test launches on 12th and 14th November went into service at Cuxhaven on December 6th 1931. The building price was 198,100 Reichsmark. Powered by a triple expansion steam engine built by Christiansen & Myer. The boiler was a single cylinder tube boiler with return flue. Maximum pressure of 14 bar, power output of the engine was 300hp at 210rpm. Alte Liebe is now at Hamburg renamed Kirstin, with a complete superstructure change and a diesel engine. In 1848 around 25 tugs were operational on the river Rhein. These were all side wheelers with a draught of around two meters. Because of the shallows in the middle Rhein it was impossible to use ships of a deeper draught. 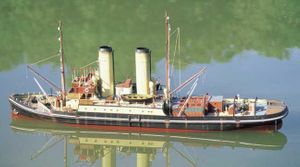 Rhein tugs were therefore lengthened to create more space for longer steam boilers, bigger engines, bunker and crew accommodation. 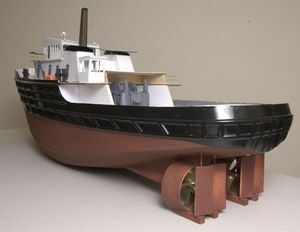 About 1880 the first propeller driven tugs appeared on the Rhein which developed more speed and needed less crew. The "Wacht am Rhein VIII" was built in 1893 as a Rhein tug by the P. Boele Shipyard at Slikkerveer in Holland. 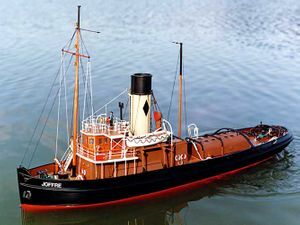 She was a tug powered by a coal fired boiler,a compound engine developing 300 IHP and was designed specially for the middle part of the river Rhein which has lots of bends and very strong currents. Her hull design is long and narrow to suit these conditions. The steering and control gear is behind the funnel giving very little view forward but with a much better view of the ships which she tows. In 1894 the ship was taken into service under the name "Wacht am Rhein VIII" by J Huttner in Wesel-Buderich. This company was established at an outstanding location on a bend of the Rhein where in addition to towage they ran a hotel-restuarant. To date (1993) this hotel-restaurant was still managed by the Huttner family although the shipping operation was sold off many years ago. 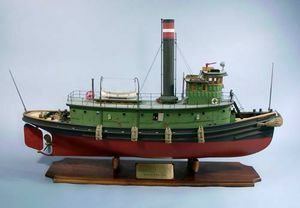 Around the turn of the century the ship came under the control of the Johann Knipscheer Shipping Company who were the first firm who dared to attempt to tow a ship upstream to Basel on the Swiss border. The ship was renamed Direktor Johann Knipscheer. In 1919 she was renamed "Speculant". Between 1924 and 1957 a number of major alterations were made to her power plant and superstructure. Today: In 1972 she was renamed Pieter Boele, after her original builder and in 1987 handed over to the Prins Hendrik Maritime Museum in Dordrecht where she has been kept in service by volunteer enthusiasts. 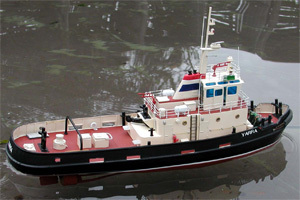 The model is based on a fiberglass hull with full plating, freeing ports, bulwarks and port detail molded into the hull. Computer generated plastic printed in 6 colors is used for the decks and superstructure to give quick and crisp assembly. A full set of fittings in cast light alloy and plastic give the finishing touch to the model adding the vital clutter that is so much part of the "TUG" appeal. As in all of the Deans kits a set of running gear is included, consisting of the prop shaft, tiller and full instructions keyed to a FULL SIZE plan to assist in the construction of the model. The "Wacht am Rhein VII" was built in 1893 as a Rhein tug by the P. Boele Shipyard at Slikkerveer in Holland. She was a tug powered by a coal fired boiler, a compound engine developing 300 IHP and was designed specially for the middle part of the river Rhein which has lots of bends and very strong currents. Her hull design is long and narrow to suit these conditions. 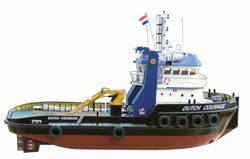 The craft is based on one of the tugs used by the Dutch navy in Den Helder dockyard, The tugs are constructed by the DELTA shipyard for the Navy. The ships are called the “Linge” Regge Hunze Rotbe and the Gowe. She is based on a standard private design and many have been constructed and sold for private service. 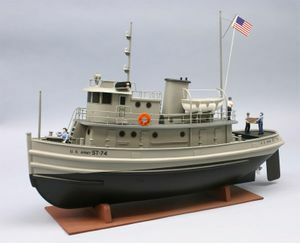 The color scheme shown on this model is fictional as the variations and colors used in the full size craft are to numerous to mention.